NASA's Mars Exploration Rover Opportunity climbed out of Victoria Crater following the tracks it had made when it descended into the 800-meter-diameter (half-mile-diameter) bowl nearly a year earlier. Afternearly a year rolling around inside an expansive crater on Mars, NASA?s trustyrover Opportunity is headed back out to explore the Martian plains. ?The roveris back on flat ground,? said Paolo Belluta, engineer and rover driver at NASA?sJet Propulsion Laboratory in Pasadena, Calif. The golfcart-sized Opportunity climbed up and out of half-mile (800-meter) wide VictoriaCrater on Mars late Thursday with one last 22-foot (6.8-meter) push that sent itcharging over the top of the crater?s rim and through a sand ripple on theother side. The maneuver brought to an end Opportunity?s studies of Victoria,which began in September 2007 when the rover made its first foray into thecrater. ?We?reheaded to the next adventure out on the plains of Meridiani,? said John Callas,NASA?s rover project manager for Opportunity and its robotic twin Spirit on theother side of Mars. ?We safely got into the crater, we completed our explorationthere and we safely got out.? Opportunityand Spirit have been exploring different parts of Mars since they landed inJanuary 2004. Since then, the rovers have found evidence that water once soakedthe Martian terrain in the ancient past amongtheir other discoveries. ButVictoria Crater, a deep depression blasted into the Martian surface withexposed bedrock that serves as a window into planet?s geological history, hasdominated Opportunity?s attention. The rover spent more than half of the fouryears since it landed on Mars studying the giant crater. Opportunityfirst headed for Victoria in late 2004 after visiting a smaller, stadium-sized crater,dubbed Endurance, earlier that year. The rover took 22 months to cross the fewmiles between Endurance and Victoria, and managed to escapea deep sand dune that held it fast for five weeks before engineers wereable to work it back out. Afterarriving at Victoria, Opportunity spent a year meticulously circling partwayaround the crater?s rim to find the best spot to drive into its interior. The roverspent so long at Victoria that NASA?s Mars Reconnaissance Orbiter circling thered planet managed to catch its path around the massive crater. Opportunity?shandlers decided last month to order the rover to leave Victoria Crater afterspotting a power spike in the automaton?s left front wheel. The roversteadfastly backtracked along its entry path to get back out, mission managerssaid. ?We wereconcerned that any wheel failure on our aging rover could have left us trappedinside the crater,? Callas said. 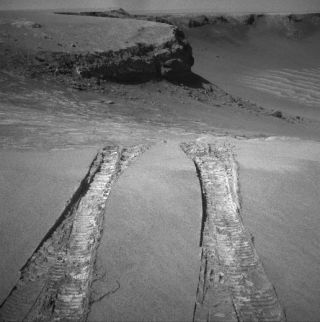 A similarspike preceded the full-blown failure of wheel on the Spirit rover in 2006. Spiritis currently building a full-color panorama photograph as it awaits bettersunlight conditions for is solar panels at its ?Home Plate? location on Mars,mission managers said. A thirdNASA spacecraft, the Phoenix Mars Lander, also hit amilestone this week. The stationary probe surpassed its initial 90-daymission earlier this week and began extended operations while digging forburied Martian ice in the planet?s arctic circle. Sincelanding, Opportunity has spent 1,635 days exploring Mars and traversed morethan 7 miles (11 km) of Martian terrain during its mission. The roveris now poised to begin hunting new targets: chunks of Mars rocks called cobblesthat lie strewn across the red planet?s surface. Researchers believe thecobbles, which are about the size of a human fist and larger, are chunks ofmaterial ejected from impacts that caused craters that are too far away fromOpportunity to be fully explored. "Our experience tells us there's lots of diversityamong the cobbles," said rover mission planner Scott McLennan of the StateUniversity of New York, Stony Brook. "We want to get a bettercharacterization of them. A statistical sampling from examining more of themwill be important for understanding the geology of the area."